A cochlear implant is different from a hearing aid. A hearing aid provides amplified sound to the ear canal, which is sent through the ear to the auditory nerve and onto the brain. For those with significant hearing impairment, the sound that arrives to the auditory nerve is not fully processed due to damaged hair cells. A cochlear implant is a surgically implanted device that bypasses these damaged hair cells in the ear and provides electrical stimulation directly to the auditory nerve, giving patients who are severely hearing impaired or profoundly deaf the ability to hear. A cochlear implant device is placed in the inner ear (called the cochlea) and under the mastoid bone behind the ear. The internal device is implanted during surgery performed general anesthesia; most patients are released from the hospital the same day. As the incision is healing, the patient will not hear sound from the implant. The implant must be coupled with external equipment and activated in order for the patient to hear. The internal device is coupled to a microphone and speech processor worn externally. 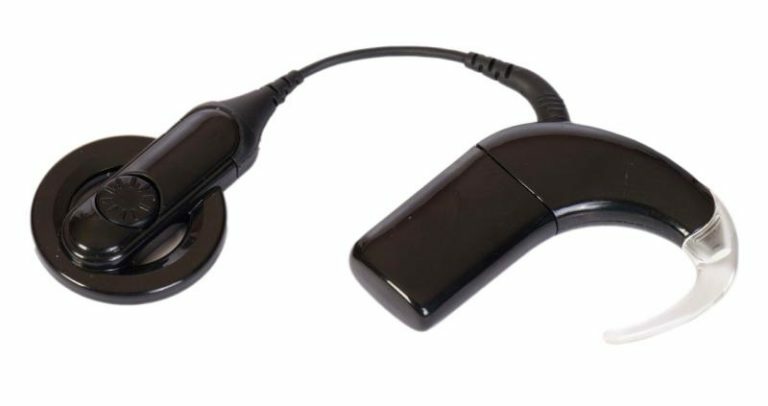 The external device is similar to a behind-the-ear hearing aid. The microphone picks up sound and changes the sound into a digital code. The digital code is sent along a small wire to a transmitter that is held in place by a small magnet in the internal receiver. The receiver inside the head alters the code into an electrical impulse, sending sound information to electrodes inside the cochlea. The electrical stimulation from the electrodes is sent along the auditory nerve, which connects to the brain. Sound is then able to bypass the damaged portion of the ear. A cochlear implant does not restore normal hearing and is not a cure for deafness. It simply gives individuals access to sound that people with good hearing have access to everyday. The goal of a cochlear implant evaluation is to evaluate what degree of benefit the patient receives from their hearing aids. The patient’s hearing aids are initially tested on a special computer to determine the output (gain) of the hearing devices; this is to ensure that they are appropriately set for the patient’s hearing loss. Once this has been confirmed, the patient is asked to sit in a sound treated room, in front of a speaker with their hearing aids on. They are instructed to respond to sounds heard from the speaker by pressing a buzzer to find the threshold with the hearing aid, this is called an aided threshold. Aided thresholds are obtained for each hearing aid at a time, from 250 Hz to 6000 Hz. Aided speech testing is also completed. The patient is asked to repeat back sentences that are delivered through the speaker, for each hearing aid and then both hearing aids together (binaural). The audiologist compares the aided results to those set by the Federal Drug Administration (FDA) in regard to cochlear implant candidates. Medicare also has standards set for cochlear implant candidates. The audiologist will then explain how a cochlear implant works, how it is different than a hearing aid and what expectations the patient should have following surgery and rehabilitation. If the patient decides to move forward, they are referred back to the physician for medical follow-up and surgery consultation. Before a patient can schedule surgery for a cochlear implant, a full exam and discussion will need to be scheduled with the otolaryngologist. The physician will take a thorough medical history and complete an exam of the head and neck. The physician may also ask the patient to obtain medical clearance from a primary care physician if any concerns exist regarding anesthesia. A scan of the temporal bone will also be ordered. This scan will allow the physician to see whether the inner ear structure is intact, detect any abnormalities that may present a challenge for surgery and also help determine the cause of the hearing loss, if unknown. As with any surgery, cochlear implant surgery does carry some risks. Our surgeon will explain these risks to you in detail and answer any questions you may have. Before a patient is implanted, the audiologist and physician must determine that the patient has realistic expectations for how they will do after surgery. Cochlear implant performance heavily depends on the duration of hearing loss, degree of hearing loss and the duration of hearing aid use. In addition, the patient will be expected to complete rehabilitation exercises at home in order to learn how to hear through the implant more efficiently. Each cochlear implant manufacturer has rehabilitation resources to help patients reach these goals, some which can be purchased or found online. Two to four weeks following implantation, after the surgical site has healed, the patient will be scheduled with the audiologist for the initial activation or stimulation of the implant. At this appointment, the device will be connected to the computer and the patient will be instructed to listen for sound through the implant as the audiologist sets the levels. Once levels are set through the computer, the implant is activated – all sound entering the microphone will be stimulating the implant. At first, many patients describe this sound as noisy. As the patient adapts to the implant over several weeks and months, the brain learns to hear and understand electrical sound. Depending on expectations set prior to surgery, the patient can learn to detect, discriminate, identify and comprehend speech in different listening environments over time. Once the cochlear implant has been activated, the audiologist will program the implant with several different maps containing increasing levels of sound. The patient will be instructed to progress through these maps to improve tolerance to electrical sound, so that speech can be heard through the implant. It is important that the patient have regular follow-up programming or mapping services, so that levels are set optimally. The audiologist will explain when follow-up appointments should occur so that the patient is seen at the appropriate intervals. Each manufacturer markets their device differently and has a different device style and function. However, all three devices produce electrical sound that allows the patient to hear through the implant. Usually, the audiologist and surgeon do not have a preference for a device unless there is a medical or audiologic consideration that is shared with the patient. Since the decision is often left with the patient, it can be difficult for the patient to decide which device is right for them. The audiologist will explain the differences between all three devices and allow the patient to try them on externally. Educational materials will also be provided to the patient to read at home. Although external equipment for cochlear implants are designed to be durable and last a long time, occasionally equipment may need repair. For cochlear implant patients, it is important to know how to contact the customer service department at their respective manufacturer for help troubleshooting their device. If the patient believes the equipment may be broken and in need of replacement, they should first try troubleshooting with the backup speech processor. If hearing improves with the backup processor, the patient should contact the manufacturer to see about diagnosing the equipment problem. More information can be found in the user manual for the processor. If hearing does not improve with the backup processor, the patient should contact the audiologist immediately to report the issue. Dr. Tucker, an audiologist at Camino ENT, can be conveniently contacted via email.